One hot summer's day, John Cole decides to leave his life behind. He shuts up the bookshop no one ever comes to and drives out of London.When his car breaks down and he becomes lost on an isolated road, he goes looking for help and stumbles into the grounds of a grand but dilapidated house. Elegant, gently sinister and psychologically complex, After Me Comes the Flood is the haunting debut novel by the author of The Essex Serpent. 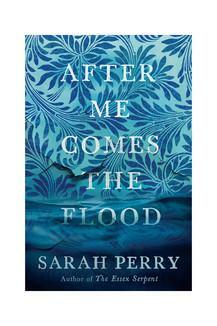 Sarah Perry was born in Essex in 1979. She has been the writer in residence at Gladstone's Library and the UNESCO World City of Literature Writer in Residence in Prague. After Me Comes the Flood, her first novel, was longlisted for the Guardian First Book Award and the Folio Prize and won the East Anglian Book of the Year Award in 2014. Her latest novel, The Essex Serpent, was a number one bestseller, Waterstones Book of the Year 2016 and both Fiction book of the Year and Overall Book of the Year 2017 at the British Book Awards. It was then nominated for a further eight literary prizes, including the Costa Novel Award 2017 and the Bailey's Women's Prize for Fiction 2017. Her work is being translated into fifteen languages.